A window has been smashed at a mosque in Birmingham, days after five similar attacks in the city. 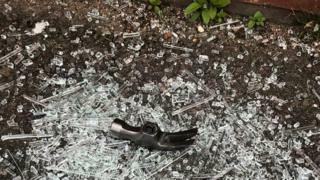 Part of a hammer was left behind at the place of worship in Cromer Road, Balsall Heath. A family living in the building said they were left shaken by the attack at about 06:30 GMT. West Midlands Police said it was investigating but not linking it to attacks on five mosques in Perry Bar, Aston and Erdington on Thursday. A 34-year-old man has been detained under the Mental Health Act in connection with those incidents. "CCTV is currently being examined and investigations continue," the force added.